A soothing infusion of pure chamomile. Chamomile is appreciated by many for its comforting, soothing taste and delicate aroma. Since it is naturally caffeine free, it makes the ideal bedtime drink. 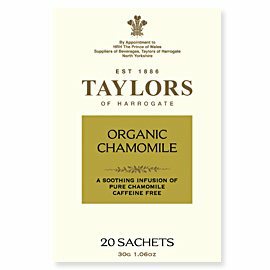 Taylor's buy organically-grown chamomile for the best purity and flavour. For the perfect cup we recommend that you use one tea bag. Add freshly boiled water and infuse for 3-4 minutes. Our Pure Chamomile should be served without milk and can be sweetened with sugar or honey. Packaged 20 tea bags/sachets per box.